Hanoi (VNA) – Prime Minister Nguyen Xuan Phuc has ordered authorities of northern mountainous provinces along with relevant agencies and ministries to augment efforts in response to torrential rains and floods wreaking havoc in the region over the last few days. Widespread heavy rains have been reported across mountainous and midland provinces in northern Vietnam. 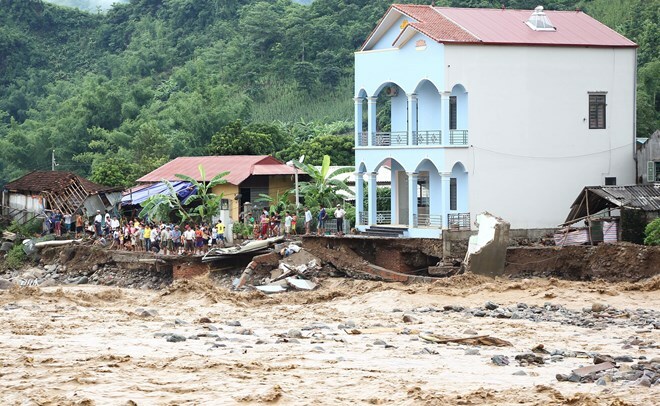 Flash floods and landslides in some areas caused heavy human and property losses, especially in Muong La district of Son La province and Mu Cang Chai district of Yen Bai province. In his written order, the PM requested provincial People’s Committees, particularly of Yen Bai and Son La, to continue capitalising on local forces to search for missing people and address flood consequences, evacuate residents from flood- and landslide-prone areas, and ensure food supply for locals. The National Committee for Search and Rescue, the Ministry of Defence and the Ministry of Public Security were told to deploy their local forces to assist search and rescue activities and help localities overcome flood consequences. While the Transport Ministry has to support the provinces to ensure traffic safety in areas with landslides, the Health Ministry must direct grassroots medical staff to provide free healthcare examination and treatment for the injured and help local residents ensure post-flood environmental hygiene. The centre for hydro-meteorological forecasting, directed by the Ministry of Natural Resources and Environment, must continue keeping a close watch on rain and flood developments to issue timely forecasts and warnings. The Central Steering Committee for Natural Disaster Prevention and Control was also asked to work with the Ministry of Planning and Investment, the Finance Ministry and relevant sides to report on flood consequences to the PM to consider assistance. As of the end of August 3, heavy rains and floods had killed nine people, injured 12 others and made 24 missing in Lai Chau, Dien Bien, Yen Bai, Son La and Cao Bang provinces. As many as 196 houses were washed away or collapsed, including 29 in Yen Bai and 167 in Son La. Meanwhile, over 13,640 cubic metres of earth and rock were eroded on national highways in the northern provinces. Floods also washed away 3km of provincial road No 109, isolating Nam Chien commune and the Nam Chien hydropower plant in Son la province. Up to 144 irrigation works in Yen Bai and Son La, along with many other infrastructure facilities in the region, were also damaged.